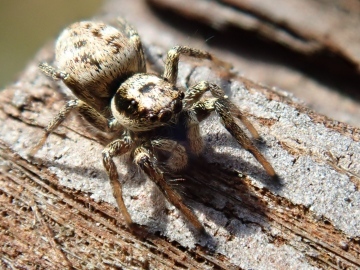 Certainly not Pseudeuophrys, looks to be the 'zebra spider' Salticus scenicus. Hi all. Just recently joined. Photographed this in my garden in Bewdley, Worcestershire (DY12 2PU). First thought it was Pseudeuophrys lanigera but not sure. Can anybody help further? Many thanks, James. Think that I clocked Cryptachaea blattea in a garden centre indoor house plant section in East Sussex last week. I collected it as I was puzzled but have since lost it. Will go to look again. However this is a heads up to look in garden centres which seem to be centres of new distribution of incoming species.